Fossilized Walrus Ivory Earrings with Sterling Silver ear wires and enhanced with fancy sterling silver wire wrapping and assorted Swarovski crystal beads. Jewelry collectors will love these truly unique Fossilized Walrus Ivory Earrings. What could be more uniquely Alaskan than Fossilized Walrus Ivory Jewelry. Each piece features a stunning piece of Fossilized Walrus Bone, and each piece is adorned with sparkling Swarovski Crystals. The Walrus is an important symbol of Alaska’s culture. The Alaskan People revere the walrus as a staple of life that has sustained them for generations. 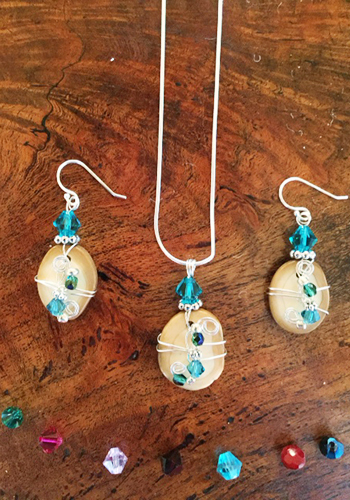 Alaskan Reflections carries Fossilized Walrus Ivory necklaces as well as Fossilized Walrus Ivory earrings. In all honesty these stunning Fossilized Walrus Ivory Earrings with their dazzling crystals, will remind you of Alaska wherever you go. The walrus symbolizes wisdom, belligerence, humor, and awkward feelings or self-awareness. Many believe that if you dream of a walrus, it means that you are protecting something or someone. It can also symbolize you are the dominant leader in a situation or partnership. In addition to having a unique piece of Fossilized Walrus Ivory these earrings are also adorned with sparkling Swarovski Crystals. In all honesty you will want to collect every one. These Fossilized Walrus Ivory Earrings will help you carry that spirit of Alaska with you wherever you go. buy Fossilized Walrus Ivory Earrings online wholesale. In order to help you save money we offer customers the opportunity to buy Fossilized Walrus Ivory Earrings at wholesale prices online. In fact you can sign up today for our wholesale program and before you know it you will be enjoying savings. Customers will be able to enjoy savings of up to 50% on all of our wonderful products.